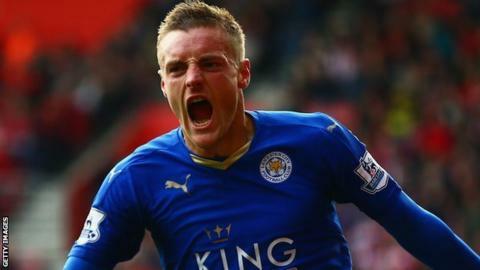 Leicester City manager Claudio Ranieri says that England striker Jamie Vardy is not for sale. Vardy, 28, has scored nine goals in as many top-flight games for the Foxes so far this season and is the Premier League's leading goalscorer. "We wait for the bigger clubs," joked Ranieri. "We don't sell him. He stays very happy here. "Nobody goes in January, not Riyad Mahrez, not him. Me, the club and our fans need all our best players." Vardy scored just five goals last season but is currently on the same number of league goals as Bayern Munich striker Thomas Muller and one more than Barcelona forward Neymar. Asked if Vardy should be considered with that calibre of player, Ranieri said: "It is too early to say this. "It is the first year he showed his attitude in the Premier League. If he can continue in this way it will be fantastic."